A BIG year for GMI – Can you help? Over 554 children have access to improved education at Bethel Christian School. Several families have improved health practices like upholding good hygiene and sanitation, improved nutritional practices, sending pregnant mothers for ANC and subsequently delivery at health facilities. This is a result of the health project, supported by GMI-UK. Local churches have been empowered to meet spiritual, emotional and Psychosocial needs of the people. This has played a key instrumental role in the healing of the people devastated by the war. When our story started with Pastor James, Phoebe & Bethel Christian School, who could ever imagine what our connection with this story would bring? We made a promise to 40 children in a tiny school in the middle of the African plains outside the town of Gulu, Northern Uganda, to see them through education. Now, 6 years on we have over 500 children in school, have provided water to 5 villages, countless grateful local church leaders have received training at our pastors conference, and have a growing primary health care programme working alongside local government in 30 villages in the area. 2015 brings ever-increasing challenges: with those original, now older children at our primary school needing secondary education. Our main focus for the year will be the necessary buildings to go with it, and the staffing and running structure associated with a comprehensive school! We are continually enthused by the amazing support we receive year on year. How can you help and be involved with us in making sure these children continue their education? 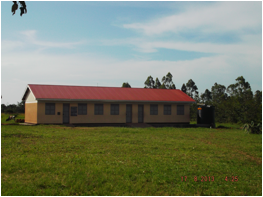 We have already sourced and paid for the land for the High School, but by September 2015 we need to raise £20,000 to build 2 classrooms, a head teachers office and store room similar to the building below. Organising a sponsored bike ride? Your school putting on a sponsored event? Do you know a company/organisation/club who would be interested in sponsoring a classroom? Thank you for your interest and support, we can’t do this without you.